Directories can be quite beneficial for those trying to increase the number of backlinks. If PageRank is important, directory listings can help improve your score. 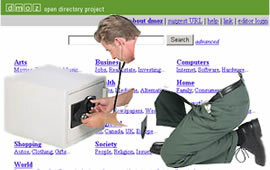 Perhaps the most popular directory is DMOZ, an open directory project that employs human editors for the submission/approval procedure. The use of human editors is founded on furthering the quality of the directory content. Any DMOZ stories to share? Discuss at WebProWorld. However, human prejudices can factor into the approval process, something that is hard to overcome if you are considering submitting to a competitive category. During the research process, I came across numerous statements about people having to wait months and even years before their site gets accepted into the DMOZ directory. "I know this is largely dependant on who the admin is for your particular category, but approximately how long is the average Submit -> Listing delay? I submitted in early June... should I check back at Christmas?" Pavel's statement was a humorous look at the wait for DMOZ acceptance. But it begs the question: How long should someone have to wait before they are approved, denied, or contacted about either? Depending on the amount of submissions a DMOZ category gets, users should expect to hear SOMETHING back from the human editors at some point. Because of the slow response times and rejections for unknown reasons, there has been an increasing amount of vocal displeasure aimed at DMOZ. Some question whether the intentions of a few editors are actually pure. SitePoint poster Kimberly commented about her experience with DMOZ, "I submitted under a heading only to learn 3 months later that the #3 player in my market was the editor. So I picked another heading… at least I am in now. It is not a fair system." Judging from Kimberly's statement, it would appear that she was the victim of another's ethical shortcomings. If editors allow personal feelings and competitiveness to affect their judgment, obviously they shouldn't be part of the approval process. This particular discussion led to one of the more damning posts about DMOZ I've read. JakeCop has had some negative experiences with the open directory and lets his frustration out on SitePoint: "Dmoz really is a corrupt system. If the editor in the category has a site in that same category, he'll simply deny any application in the interest of defeating competition… I submitted one of my major sites back in April, and don't expect to ever be listed… I even had one of my sites edited so that it went to a different URL, google bombing my main keyword to a competitor. Dmoz should be burned in the fires it was forged." Again, this is a case of personal prejudices and overlapping business interests interfering with a simple approval process; something that doesn't have to be considered when an automated spider crawls your site. To be fair, every editor that volunteers to DMOZ isn't going to mistreat your submission, although it may be awhile before it gets approved. At the Cre8asite forums, Kensplace again gives some really good feedback concerning DMOZ and the approval process. Ken speaks about using DMOZ as a search tool and how the editor's lack of punctuality and/or the one site - one submission standard can damage the effectiveness of DMOZ: "do you not think you would be even more satisfied if the millions of sites that didn't make it into dmoz were available for you when you search? Think of all the bargains you are missing, think of all the information, research and technical data that is NOT available on dmoz due to its behavior." Granted, not every testimonial I read was negative. A thread on the Digital Point forums spoke of a DMOZ editor assisting a web site owner in the approval process. The poster had waited about 3 months and still no approval, so they decided to email the category editor. After receiving the mailing, the editor "promptly added [the] site to dmoz." So there is still hope. The thing I'm left wondering is if all it took was an email to get the approval going, what was going on the 3 months beforehand? Was the editor that busy? Or were they being negligent to their submission queue? Such are the risks when relying on human intervention. Chris Richardson is a search engine writer and editor for WebProNews. Visit WebProNews for the latest search news. The iEntry Network consists of over 100 web publications reaching millions of Internet Professionals. Contact us to advertise. WebProNews is the number one source for eBusiness News. Over 5 million eBusiness professionals read WebProNews and other iEntry business and tech publications. WebProNews provides real-time coverage of internet business. Plus over 100 other newsletters! Send me relevant info on products and services. View all recent mentions of WebProNews from around the world!